The landslide in Manipur’s Tamenglong district headquarters, which claimed 9 lives and left 5 injured, was “closely linked with the heavy rain in short duration with high intensity of rainfall may be treated as climate change event,” according to climate experts. Heavy rain with high intensity was started aftermidnightof the July 11 and a total rainfall of 158.8 mm was received within the next five hours i.e. 12 midnight to 5 am of July 11, 2018, according to nodal officer Dr T Brajakumar of the State climate cell of Environment Directorate. During2-3 amof July 11, 2018, about 44.2 mm (i.e. 44.2 liters of rain water at 1 square meter areain one hour) was recorded as total rainfall in an hour, which is treated as very high intensity, said Brajakumar who has been monitoring the state climate datas since the few decades. This heavy rain in short duration with high intensity may also be one of the reasons for landslides occurred at New Salem, Tamenglong, and Ward No. 4 at around3 amof July 11, 2018. Wednesday’scasualties are the largest since 20 people were killed in a massive landslide in August 2015 in the remote village of Joumol in Manipur’s Chandel district bordering Myanmar. A State Government employee, who had been staying in the Tamenglong district headquarters, which is about 150 km west of Imphal for quite some felt thatWednesday’srain was one of the heaviest rainfalls in the district. Echoing a similar feeling, a resident of ward No.4 also informed that there was a similar incident around a decade back following heavy rain. The heavy rain on July 11 also submerged a large area of paddy fields in the Noney area under Noney district of the state as well, reports added. Tamenglong like situation already occurred in Senapati after the district received a large amount of rain(40.8mm)within one houron August 26, 2017. 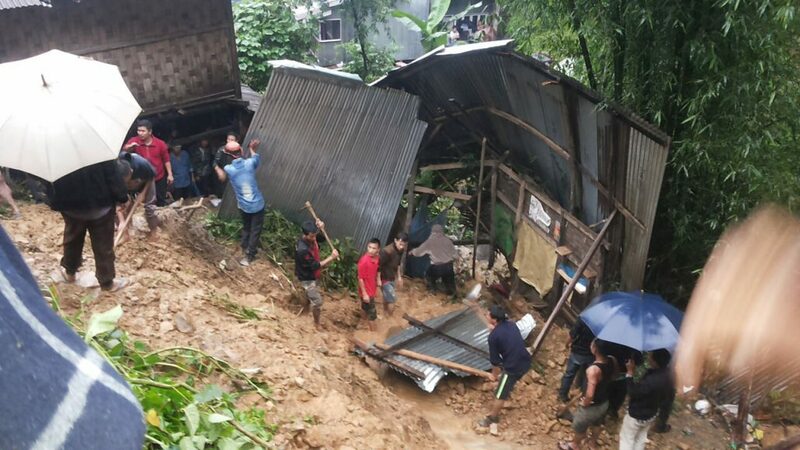 On April 5, 2017, four houses and one local playground were damaged by a massive landslide at Sirarakhong village following intense rain in Ukhrul district. Interestingly, Imphal also received the highest rainfall since 1956, recording 2,439.4 mm in 2017 tillDecember 13or 68.71% above the state’s annual precipitation of 1446.3mm,according to a press release of the Indian Council of Agricultural Research’s Imphal centre issued onDecember 13last year.Rainfall above 2,000mm was recorded only in 1991 (2,110.6mm) and 1993 (2,171.6mm, it added. In 2017, the highest rainfall was recorded onMarch 31(103.4mm).